UniWASH is a multi-stakeholder water, sanitation and hygiene project implemented by UNICEF in Uganda. The project aims at improving children’s access to safe water and sanitation by partnering with private sector and civil society to test promising WASH solutions for scale-up. Inadequate sanitation and hygiene facilities as well as lack of clean water in schools cause illnesses and absence from class. Especially girls are affected because they are unable to take care of their personal hygiene during menstruation due to lack of sanitary conditions in schools. UNICEF looks for innovative ways to accelerate development to improve the lives of children. This is done in partnership with different stakeholders such as governments, civil society, private sector and academia. One example of this work is UniWASH project which concentrates on improving water, sanitation and hygiene (WASH) conditions for children in Uganda. UniWASH started off from the fact that new WASH products and concepts are constantly being developed and these are believed to solve WASH problems in countries like Uganda. However, a single invention will not solve the overarching issues regarding water and sanitation. UNICEF sees that products and services must be accessible to children and replicable to new environments. This calls for help, ideas and commitment from all actors. Human waste -based fertilizer - a concept for turning sanitation waste into fertilizer for added value. The testing of these are continued by private sector and civil society partners in Phase II of the project during 2017-18. Phase II pays closer attention to the enabling environment for improved WASH services. The focus is on WASH ecosystem strengthening by bringing different stakeholders together to understand the opportunities and challenges in improving access to safe water, sanitation and hygiene for all, with special attention to children. These activities include policy advocacy as well as modelling private sector engagement to contribute to removal of WASH bottlenecks. In UniWASH phase II, UNICEF partners with Water for People Uganda, and two Finnish companies Biolan and Korkia. 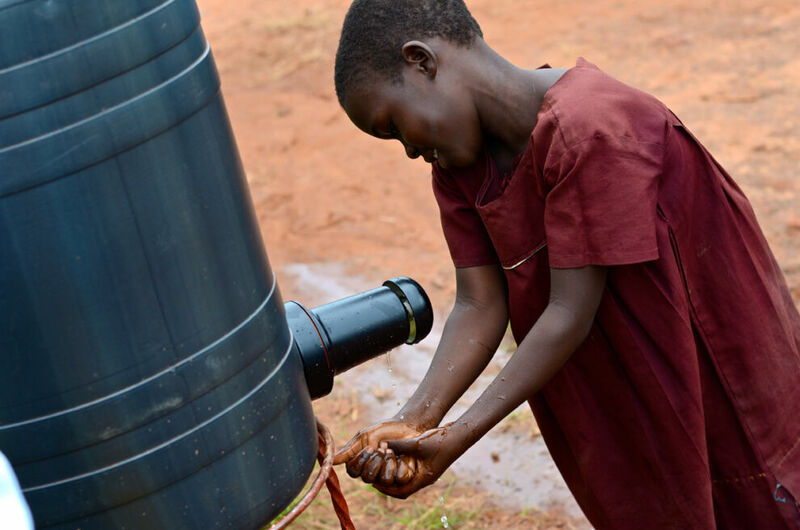 One of the jointly developed solutions is the Elephant Tap, a hand-washing tap which conserves water and reduces time children need to spend on fetching water during school days. The Elephant Tap is tested for market viability (proof of concept) in UNICEF supported schools in Mozambique. Biolan continues to partner in the project by developing and manufacturing a new version of the Taps to be tested. Sanitation waste containment, treatment and reuse is developed into a sustainable and safe cycle through Sanitation as a business model. This work is done in cooperation with CSO partner Water for People Uganda. Sustainable sanitation value chain concept is developed together with Korkia Ltd to create a solution that convenes all WASH actors in a coordinated manner to manage the whole sanitation value chain from hygiene promotion for children and their families to safe latrine emptying, sludge treatment and upcycling. All this is envisaged to be economically, environmentally and socially sustainable through a business model, creating a long-lasting solution to safe sanitation. In addition, UNICEF and partners will boost advocacy work towards decision-makers to gear more interest to the socioeconomic importance of safe sanitation in order to achieve Sustainable Development Goal 6: Ensure availability and sustainable management of water and sanitation for all. UniWASH project is being implemented in Uganda during 2017-18 and is funded by development cooperation funds from the Ministry for Foreign Affairs of Finland.